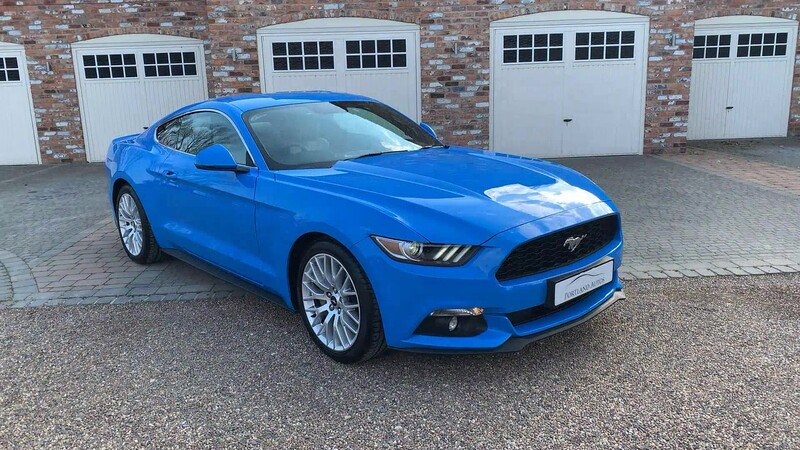 2017 17 FORD MUSTANG 2.3 ECOBOOST AUTOMATIC COUPE IN THE STANDOUT COLOUR COMBINATION OF GRABBER BLUE WITH CERAMIC CREAM LEATHER INTERIOR. SPECIFICATION INCLUDES CUSTOM PACK, 19 INCH MULTI SPOKE ALLOYS, HEATED AND AIR COOLED FRONT SEATS, SHAKER SOUND SYSTEM, SATELITTE NAVIGATION, REVERSING ASSIST CAMERA, KEYLESS ENTRY, CRUISE CONTROL, ELECTRIC FOLDING EXTERIOR MIRRORS, DUAL ZONE CLIMATE CONTROL, DAB DIGITAL RADIO, BLUETOOTH AUDIO STREAMING, APPLE CAR PLAY, KEYLESS START. THIS CAR WAS REGISTERED IN MARCH 2017 WHICH MEANS IT QUALIFIES FOR THE LOWER ROAD TAX! THIS CAR HAS HAD IT'S FIRST SERVICE AT FORD AT 2,876 MILES. 2xKEYS, HPI CLEAR, FINANCE AVAILABLE, PART EXCHANGE WELCOME, TO VIEW UP TO 40 HD PHOTOS AND A HD VIDEO OF THIS VEHICLE PLEASE VISIT OUR WEBSITE.